TRANSPORT IN TANKS - Grupo Startrans, S.A.
Startrans offers you logistical solutions for the transportation of bulk liquids through the use of tank containers, both for “Short Sea” and “Deep Sea” traffic, as well as intra-European traffic using the intermodal system. 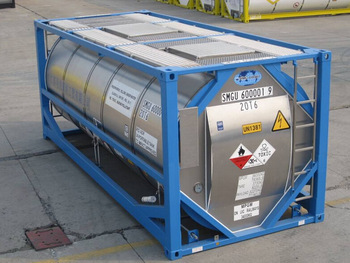 The tank container for transporting bulk liquids consists of a tank contained within a metallic structure made up of a series of steel bars. In this respect, the tank presents all the benefits characteristic of a standard container; it can be stacked and it can travel on any means of transport typical in the multimodal system (lorry, rail and ship). Made of stainless steel, these containers can be used to transport dangerous substances such as toxic, corrosive and highly inflammable liquids. They can also be used for non-hazardous substances, such as resins, natural latex, synthetic latex, milk, beer, wines and mineral water. 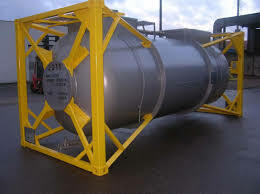 The type of tank containers available according to whether the cargo consists of Food Products or Non-Food products.